I know that I’ve tended to be very critical of Elsevier on these pages [peer review, economics, PLoS clone, RWA, profits]. I’ve sometimes wondered whether that’s really fair: after all, Elsevier are just one among many exploitative for-profit non-open scholarly publishers, right? Shouldn’t I be equally harsh on Springer, Wiley, Informa and the rest? I’m not alone in this, of course. For example, Tyler Neylon’s bare-bones site The Cost Of Knowledge — registered only six days ago, according to the whois record — is a call to boycott Elsevier in particular. Researchers are invited to “declare publicly that you will not support any Elsevier journal unless they radically change how they operate”, by signing a declaration to refrain from publishing refereeing, and/or editorial work. Impressively, this has gone from non-existent to 618 signatures in six days; you should consider whether yours should be the 619th. So why Elsevier? Partly, I think it’s just a convenient shorthand to say “Elsevier” rather than “exploitative for-profit non-open scholarly publishers”. But there are specific reasons why it wasn’t Blackwell, to pick a name at random, that rolled the snake eyes. As well as the restrictive copyrights, predatory pricing and obligatory bundling that are so ubiquitous, Elsevier is also responsible for the six fake journals that misrepresented sponsored content as legitimate research, involvement in the arms trade, repeated obstruction to the re-use of data, making campaign contributions to representatives to propose the Research Works Act and then feeding those representatives the very words they want them to say in support of it. But a couple of days ago I learned of yet another reason why my attempts to be gentle and kind to Elsevier are doomed. It’s not been widely publicised yet, because the reporting has been in German, but Elsevier are now filing lawsuits against their own customers. Almost at the same time, on 19 December 2011, the science publishers Elsevier, Thieme and Springer filed a suit with the Zurich Commercial Court, which is intended to forbid the ETH library to continue its document delivery service in its present form. Through this service clients of the ETH library can request the electronic delivery of articles from scientific journals. The copies may only be used internally and must not be passed on. In addition, the ETH library pays an annual compensation to the copyright-collecting agency Pro Litteris. The publishers that have filed the lawsuit want to prohibit this service on the grounds that they themselves offer these articles online, although usually for about 30 euros per article, a multiple of what access through the ETH library costs. By their suit, the science publishers want to subvert a provision of Swiss copyright law that explicitly allows the copying of excerpts from periodicals. In comparison e.g. to the situation in Germany, where such copies are forbidden, this provision is an unambiguous advantage for Switzerland as a science site. I want to add some commentary here, but … What can I add? I am lost for words. How much lower can they go? But there are specific reasons why it wasn’t Blackwell, to pick a name at random, that rolled the snake eyes. If another service is providing (even at fee) their commodity, I wonder how far ETH can protest? the science publishers want to subvert a provision of Swiss copyright law that explicitly allows the copying of excerpts from periodicals. Maybe ETH is just getting caught in the gears of the differences between physical and digital copying. In respect to the oncoming digital revolution, something good MIGHT come of this even if Elsevier/Thieme/Springer win: digital objects will attain a higher level of equivalence with paper, meaning that regulations and laws controlling copyright and trademark will have to consider them in the same terms as paper copy. Good! The sad thing is that there is nothing new in this: they’ve been evil buggers for a long time. Reidel (later absorbed by Kluwer, absorbed in turn by Springer: these guys have a desire for monopoly-formation that would have warmed J.P. Morgan’s heart), back around 1980, had a subscription price for journals and a cheaper “individual subscription” rate: to subscribe as an individual, you had to submit a signed statement saying that your subscription would not “replace” an institutional subscription, and one year, if my memory is right, they even wanted you to swear that you wouldn’t leave your collection to a library when you died! Allen, I’m afraid I don’t know who any of the people in the photo are. 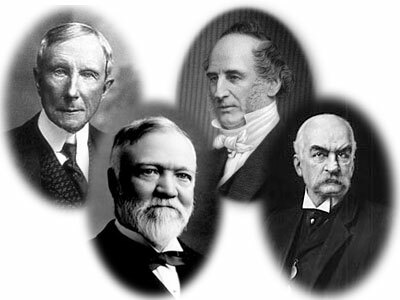 I just found a visually striking image called “robber barons” and went with that. Sounds a lot like Elsevier. I don’t know whether it’s relevant to ETH but libraries acquiesce in signing the most restrictive licences. The licence that Cambridge signs with Elsevier forbids me to do *anything* with Elsevier content – index, crawl, text-mine, data-mine, etc. We don’t own it, we rent it. The ONLY innovation that publishers have created in the last 10 years is the restrictive licence. I shall blog on this today. (I wish I could get on with my “work”). And yes, It’s the whole lot of the publishers. But Elsevier is worst in spearheading the RWA. Thanks, Nima– I Googled Cornelius “The Public be damned!” Vanderbilt, and it does look like him. I think I was wrong about the thin-faced man at top right: it looks like Henry Ford. Comparing these guys to Springer and Elsevier … I think the profits in acidic publishing have been high for a while, but the increasing concentration in that industry (witness my little story about who Reidel has become) surely makes it easier for them to maintain ridiculous prices. To use the terminology of the early 20th century “progressives” who tried to rein in the older robber barons: we’re up against “the knowledge trust”! How much lower can they go? As low as you allow them to go. These people can only do what they do because the State is there to turn their fallacious ideas (copyright) into action. As long as you refuse to properly define the problem, and then attack it, these systematic abuses will continue ad infinitum. Finally, your attempt to connect the ‘robber barons’ to this is dangerous; capitalism is not the problem, and you should not conflate it with the crony capitalism on display in the problem you are describing. Mathsias, what then is “the problem” that we are refusing to properly define? I am not being snarky, I genuinely want to understand your thinking here. You suggest that the problem is not publishers but the state — but I assume you are not saying that a political revolution will be necessary to get out from under the thumb of scholarly publishing? In the same vein, I’d like to understand why the robber-baron analogy is dangerous. The analogies seem pretty clear to me: the publishers, like the barons, have attained a position of enormous power, and are maintaining it by ethically questionable means with the collaboration of politicians. No? I’m with Mathsias – this cannot be about capitalism (rogue or otherwise). This is about the process of scholars GIVING into to the business model, then demanding that the publishers GIVE BACK the information. When someone can give me a justification for the concession of copyright in the first place, perhaps I will change my view, but the publishers are charging only what the market will bear…and the broader markets seems content with this triple taxation (grants for research/effort of peer review/journal subscription) model. Instead of imposing OR changing laws to break the system, just stop feeding the monster. Right? I am very sympathetic to that approach. That’s the bottom line. Things like the NIH’s Public Access Policy make it much easier for people in this position to do The Right Thing. They can point to the mandate, and go right ahead with making their work freely available via PubMed Central, even if they are publishing in a paywalled for-profit journal for career reasons. In effect, the NIH is greasing the wheels as we try to make the transition to the all-open knowledge economy that I think everyone knows will be the best thing for the world at large. And that is why the RWA is toxic. It’s an attempt by publishers to force publishers to choose. “No”, they say; “You can have your work appear in our journals or you can make it available to the world”. It’s right and proper that the US government says that, at least when it’s funding the work, you don’t have to make that choice. The law of supply and demand naturally drives the price of any item (e.g. a text file of a particular scientific paper, an mp3 file of a particular performance of a song, an mpeg file of a particular movie, a computer program, . . .) which can be produced in arbitrary numbers at zero marginal cost to zero. Thus publishers of any sort are seeking more and more state support to prop up a business model that in a strict laissez faire market system would already have collapsed (ACTA, SOPA, RWA, the law suit cited in the article. . .). In doing this, they pose a threat to civil liberties, and in the scientific context have perverted what in the American setting is the stated purpose of copyright “To promote science and the useful arts. . .” so that copyright now has the opposite effect — impeding progress in science. Scientific publishers get their content for free (or even impose page charges), their editorial work done for free (that includes “refereeing”, the most important part, and even the assignment of referees by volunteer editors), now get their typesetting (the really valuable service they used to provide) done for free by the authors, then charge the authors’ employers (universities and research institutes) exorbitant subscription fees to receive copies of the results, or to access them on the publisher’s server. Academicians in some disciplines have organized peer reviewed open access online journals, for which the cost of accessing scientific papers is the natural market price: free. Scientific publishers have outlived their usefulness and become rent-seeking parasites on the scientific community. The question now is: how much damage to science and civil society will their attempts to prop up an unsupportable business model cause? In the past, printing the paper copies of a journal, informing about them, delivering them was a valuable service provided by a publisher. All this is incredibly simpler and cheaper now. Without laws written to defend the financial interests of Elsevier, Springer et al., the price would go down when the cost went down. Now publishers do not add any value to a scientific paper or book, as DNY explained. But they want to charge even more than in the past. The only way to do this is to restrict access, which is impossible without ridiculous copyright laws, which even do not defend any right of authors in the US (they do defend “the moral rights of the author” in Europe, but I don’t know to what extent). Scientific journal are not needed anymore. They are an archaic form of the dissemination of the knowledge which was forced upon scientists by the technology available two hundreds years ago. What is the point of arranging several unrelated papers in an issue of a journal? The only argument in support of the current journal system to which I am a little bit sympathetic is the need of young people to have prestigious publications in order to get a good job. But the prestige anyhow comes from the scientific community, not from Elsevier. It is not Elsevier who accepts a paper, it is us. An alternative system of delivering prestige and hiring young people is largely in place: the letters of reference. Or senior scientists may post their signs of approval directly to the web. The only thing that is missing is the will of scientific community to abandon an outdated system of distribution of knowledge. Libraries can get permission from authors directly. Alternatively, Creative Commons should permit scientists and scholars to log on, and broadcast a broad permission to use “all” or named, selected works of theirs so far as they are concerned. Publishers do NOT exclusively control these rights under equitable principles of publishing law—not necessarily, and most particularly in the academic case, where authors often sign contracts unrepresented, under duress, and often on illegal or at least grossly non-economic terms. As a literary agent/lawyer I have seen the gamut of this type of insanity. What publishers (and most blog commentators) do not understand is that mere contract dictation is not law. Few have read the law of publishing carefully. The difficulty of litigating is deemed prohibitive, but we are heading into a zone in which might no longer makes right. What’s more, publishers’ might is strictly limited as a legal matter. They’re rent-seekers, and their current (or rather, past) monopoly is not necessarily guaranteed under law. Thanks, lynnux, that is an encouraging perspective. Nevertheless, I feel that if a corporation with annual revenue in the region of £2bn were to so much as threaten to sue me, I’d have little option but to fold, whatever the ethical or legal rights or wrongs of the situation. I just wouldn’t be able to afford to fight it. I am sure this is what large corporations generally rely on. Elsevier is not providing a “service”. They illegally “bought” rights to publicly funded scientific literature and run a pdf distribution which a single thousand dollar PC server could easily handle…while reaping in billions of blantantly extortionist profit. A handful of graduate students could have scanned in the archived literature in the 90’s and we would have free access to all archived scientific literature which already deserves to be in the public domain. Elsevier and other publishers have crippled scientific and medical advances, and have killed innovation and even people (I think) because of their greed, who could have got better treatment though more educated doctors and medical researchers. At the very least, governments should step in at this point and just buy the pdf articles from these crooks if they cannot legally prevent them from doing what they have done. It would be for the betterment of mankind. Aaron Schwartz is a hero. Tim, I certainly agree with the general thrust of your argument. But I’m intrigued by your claim that Elsevier illegally bought the right to literature. I would argue that what they’ve done is immoral, but I don’t see what law it breaks. Please explain? Copyright law. (Which is actually a good thing, and not broken, but authors need to start understanding copyright and using it in their own interest, and stop fixating on what “prestige” publishing label they want to affiliate with.) Elsevier licensed exclusive rights to the content from authors who signed it away. Authors need to start controlling their contracts better. And not playing ball with work for hire or other overreaching contracts. Again, I agree that the way Elsevier and other legacy publishers have abused copyright is reprehensible. But I’m still not seeing what law has been broken. What am I missing? Elsevier isn’t breaking any laws. If people are sued by copyright the litigant who has by contract or law the right to enforce that copyright claims the infringer is breaking the law. (Having a large corporate publisher own one’s work is often thought to be an advantage because they will enforce the copyright rather than making you do it, supposedly, although if you read the fine print you will often find that they disclaim any such duty, indeed, make you pay for whatever they might do of this nature.) Tim I believe is confusing his argument that publishers are worthless now, which is an economic argument with quite a bit of merit, with the idea that publishers must be breaking the law. They probably are not, but the way activists’ minds work when they are annoyed, is to look for and make arguments that whatever they don’t like violates one or another law. If people are sued under copyright, that is. I disagree that Elsevier isn’t breaking any laws. There are laws and there are laws and legal precedents. Laws are about fairness and fair rights. If someone steals something because of some technicality or a incorrect or contradictory law (or usually common practice) then that does not make it legal. The majority of research that is published by Elsevier is financed by the public, and deserves to be in the public domain. This includes many university books as well. Making a “grab” for this publicly financed intellectual property is illegal by many interpretations of our laws as well. That companies like Elsevier use our own FBI to go after the late Aaron Schwartz for redistributing decades old publicly financed works should be a public outrage as well. It is time to go on the offensive against these sharks. Most if not all publishers have no authority to sue for copyright infringement without the full approval of the author. What is more, publisher boilerplate is so routinely overreaching, it is most unlikely that authors will be inclined to agree to be financially liable for the costs of such a suit. If you read a lot of that boilerplate, the publisher gets to sue, and the author has to pay. For everything. In other words, to fully finance the publisher’s silly legal crusades. So my bet is that a lot of these litigations can be knocked out on simple grounds of failure of standing. You may be right, Lynn. The problem is, who is going to gamble on that, and pay the costs of defending a lawsuit? As with patent trolls and other bad-actor litigators, most victims with fold. A standing argument can be made by any defendant. Society needs to subsidize more pro bono counsel, to do more than e.g., death penalty cases, or other high profile suits. And we need more loser pays rules (modifiable by judges). Courts like to do justice. So people need to have faith. Only the authors and creators “own” literary works. Publishers are simply limited licensees authorized by the owner to publish and sell specific types of products in particular forms, for a specific yield to the owner, as to which there was a very specific meeting of the minds back when the contract was signed. Periodicals for example inherently have a limited distribution and temporal lifespan. Furthermore, a lot of contract boilerplate may be void, since it is driven down unrepresented authors’ throats. Authors are a class that the law broadly protects, like consumers. A lot of overreaching click button boilerplate may very well not be particularly enforceable by publishers against authors. A publisher litigation is a separate joint venture enterprise. No one really pre-agrees in advance to such things in a contract dedicated merely to authorizing a publication for a stated yield. The general common law legal principle is that agreements to agree are not enforceable. Only the authors and creators “own” literary works. Publishers are simply limited licensees authorized by the owner to publish and sell specific types of products in particular forms, for a specific yield to the owner, as to which there was a very specific meeting of the minds back when the contract was signed. That is true of literary works, but not of research articles, for which the copyright is routinely donated to the publisher. They really do literally own the author’s work. The legal issue with that is “routinely.” It is an open question whether the predatory imposition by corporate publishers of work for hire contracts on authors, particularly scholars, subject to “publish or perish” imperatives (itself an abdication of responsibility by university adminstrators to distinguish amongst their faculty by quality, not quantity, or publisher “branding”), is really legally valid at all. However, it is really up to authors to stop signing bad boilerplate on the bottom line, and start getting tougher about what those contracts actually say, particularly when the publisher is paying them little to nothing and not accounting to them with respect to other unrevealed exploitations of their works. They will need to use good agents or good attorneys to do this, and these days the only really good agents ARE attorneys. Traditional literary agents are often ignorant and hidebound in cleaving to past habits and “standard forms” of past business models, which reflect a time when print publishers exercised a (natural) monopoly over the means of production (publication). As ignorant and hidebound or purely self interested as publishers themselves. The failure of these habits to change with the times is known as “market failure.” But there are signs of stirring out there. It is really not in any academic’s interest to have some purely money focused entity in total control over their copyrights. Particularly when those entities refuse to account to them or consult with them in any way. Authors themselves have the keenest interest in their own works, as well as, by and large, the best judgment about what, and what not, to allow others to do with their works, and for what price or terms of contract. That minor point aside, though, I am unsurprisingly very much in agreement with you. They are work for hire if people sign, as they often do, contracts that say the work is to be deemed “work for hire.” Yes, work for hire in some contexts is perfectly appropriate. However, I have seen many contexts in which it is entirely inappropriate but the author felt they had no choice but to sign on the dotted line.